In his talk titled “Laughing at Misadventures”, Hong Kong Comedian Vivek Mahbubani will share the often-overlooked side of comedy that would both make you laugh and even cry a little through his jokes and stories. Program in English and free admission. Please RSVP to secure seats. 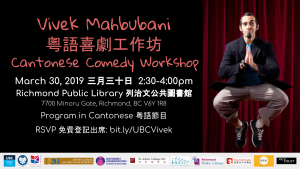 Vivek Mahbubani – Comedian 棟篤笑 is a bi-lingual and Hong Kong-bred stand-up comedian who performs in both Cantonese and English. He was crowned 2007 Chinese and 2008 English Funniest Comedian in Hong Kong and was the host of the TV series “Hong Kong Stories” by RTHK 香港電台. He appeared in a cameo role for the movie “All’s well, ends well 2009” and is a headliner at TakeOut Comedy Club Hong Kong. He was recently named one of the 2018 Ten Outstanding Young Persons of Hong Kong. Thursday, March 28, 2019 at 6 PM – 8 PM CHBE Building 101 2360 East Mall, Vancouver, British Columbia V6T 1Z3 Program in English. Free admission. 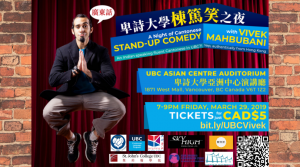 Vivek Mahbubani – Comedian 棟篤笑 is coming to UBC! Enjoy a night of Stand-up Comedy in Cantonese! Only $5 cash admission at the door. Please RSVP to reserve your tickets. Vivek Mahbubani is a bi-lingual and Hong Kong-bred stand-up comedian who performs in both Cantonese and English. He was crowned 2007 Chinese and 2008 English Funniest Comedian in Hong Kong and was the host of the TV series “Hong Kong Stories” by RTHK 香港電台. He appeared in a cameo role for the movie “All’s well, ends well 2009” and is a headliner at TakeOut Comedy Club Hong Kong. He was recently named one of the 2018 Ten Outstanding Young Persons of Hong Kong. Saturday March 30, 2019 2:30-4:00 pm 列治文公共圖書館 Richmond Public Library 7700 Minoru Gate, Richmond BC V6Y 1R8 粵語節目。免費登記入場。Program in Cantonese. Free admission with registration. Program in Cantonese. Free admission with registration. This series of events is organized by the UBC Cantonese Language Program of the Department of Asian Studies and co-sponsored by: UBC Asian Canadian and Asian Migration Studies Program, Centre for Indian and South Asia Research, Fairchild Radio, History Research Cluster, Hong Kong Studies Initiative, Institute of Asian Research, Media Analytica Inc., Sky High Productions Limited, and St. John’s College.